When you convert a computer ATX power supply into a DC bench supply it can include up to 5 voltage outputs plus a ground. An ATX PSU (power supply unit) will always have four voltage rails — one each for +3.3 volts, +5 volts, +12 volts and -12 volts and sometimes there will be a fifth rail for -5 volts. These five voltages are made by connecting the negative DC terminal to the GND output and the positive terminal either to the +3.3v, +5v, -5v,+12v or -12v output. The unit is not limited to just these voltages. It is possible to have as many as 22 different voltages by connecting the positive and negative DC terminals in different combinations. Like any other shop tool, it helps to know how to get the most out of the unit. Understanding a little more about these combinations could make it one of your most often used manufacturing tools. The columns from left to right list each output for connecting the positive DC terminal and the rows from top to bottom list each output for connecting the negative DC terminal. The voltage is displayed at the intersection of a row and column. For example, by using a multimeter with a red positive lead and a black negative lead and by connecting the black lead to the GND terminal and the red lead to the +12v terminal, you would get +12 volts. But, if you were to reverse the leads and connect the red lead to the GND terminal and the black lead to the +12v terminal, you would get -12 volts. The terms used are just generally “High” “Medium” or “Low” because the exact number of amps will vary from one PSU to the next, but the rails with the lowest amperage will be the -5v rail and the -12v rail and will usually only have one wire each. The remaining voltage rails plus the ground will have multiple wires. You may have noticed that when a certain voltage can be made with more than one combination (e.g. +12v and -12v), then it may be better to choose the combination that supports a higher amperage. When connecting devices and placing the unit under load it is usually better for the unit to be able to handle more current than less current. Still, some devices may draw as much current as you feed it and they may overload and fail as a result. Be careful about using the low amp combinations. 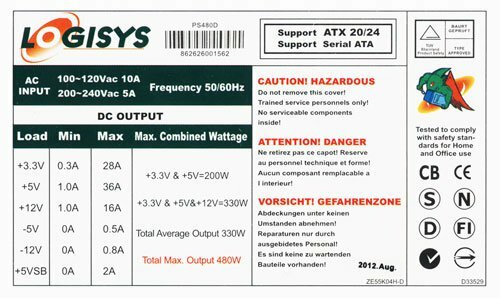 You shouldn’t have to worry too much, though, because most ATX PSUs have over current protection and the unit will simply shut down if the current load exceeds the limits set by the manufacturer. There are only two voltage combinations that fall into the “Low amp” category: -7v and +7v (the ones color coded green in the chart above). There are high amp combinations available for -7v and +7v (the ones color coded red) and might be a better choice in most situations. Perhaps the low amp combination should be avoided for this reason. 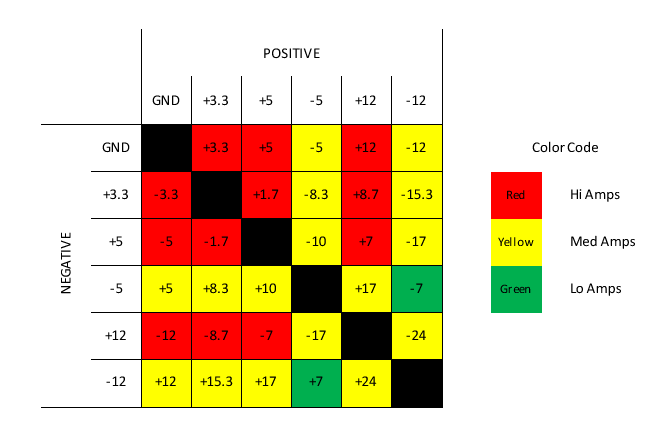 I have looked at your chart for generating negative volt, because I am looking for a solution on how to add negative 5 volt to a regulair ATX psu. I need to be able to draw up to 500ma (0.5a) on negative 5volt to say it short. Are there any disadvantages, using this aproach? Any dangers or anything to look for, when doing this? The reason for asking, is that I need to be able to mount and use a modern (fairly) ATX psu in an old computer with ISA slots, that really need negative volt. Destroying a motherboard, an ISA expansion card or both are a big no-no. The only way I know how you would have a negative voltage rail is if the power supply already has it built in. I also notice that the white wire -5 volts is not there in my PSU, so would that mean that the components and , or, dedicated spot on the PCB to resolder that wire is non existent in my PSU ??? So with no minus 5 volts to do those voltage combinations, how can it be done? Do you think a variable voltage and amperage unit , that could be plugged to the modified PSU binding posts individually to obtain a combined voltage output as needed and suitable to regulation of voltage and current up to at least 10 or 12 amps. See ,it would be nice to be able to operate a 75″ long foam wire cutter at 11.6 amps on 12 volts, a table foam cutter of say 24″ long at 2.14 amps on 12 volts, and a handheld 10″ foam wire cutter at 2.16 amps on 5 volts. The various other voltage could be used for other experiment with electric motor for model air and ground vehicle. Sorry for such a long message, but you are the first place and can ask my questions and hope to get an answer. Re: The white wire for -5v. Yes, sometimes it’s missing. Most older PSUs have it but a lot of the newer ones don’t. You can try connecting device negative to the PSU +5v positive and the device positive to the PSU GND. That might give you the -5v you want. Personally, I don’t think it’s a good idea to use multiple voltage sources. It might cause problems. Why don’t you use the iMicro IM400W 400W from the previous post: https://pcbsmoke.wordpress.com/2012/11/21/converting-an-atx-power-supply-into-a-dc-bench-supply/. I see it’s still available on Amazon.com. The one I bought has a 26 amp 12v rail and a 30 amp 5v rail. This should work for your application. You can power the 75″ long wire plus the 24″ long wire from a common 12v source. Even if they are both being used at the same time that’s 13.74 amps, about half of 26 amps available. I’m not sure if the capacity is still the same on the one offered at Amazon at this time but this was a very popular PSU for the reason that people chose it because it put out a lot of power. The one power supply I have was bought brand new in its box, at a computer store sort of garage sale for $5.00 along with a 20 to 24 pin adapter for $2.00. It is a Foxconn HH-450UNEA 350 watts and it is compliant to ATX12V 2.2. I dont know what the VSB means. +5v / 25A with +3.3V / 18A for 130W max. What would be the resulting usable voltage and amps. ? +12V1 / 14A with +12V2 / 16A for 19A Max if the usable voltage would be 12 V at 19 A that would provide 228 W and that is not shown anywhere instead the Max says 335W. That is how I came to try and understand the ATX combined voltage picture. What would happen if I tried using the foam cutting wire of lower amperage need then what lets say, the 12V1 and 12V2 are providing? Not to worry only one cutting wire apparatus will be used at a time. Small Ebay voltage and ammeter would be nice to see what is beeing used when at work. You can see I have lots of questions. That’s the idea. That’s what you want to do. Always put a current load that is less than the capacity of the rail. Most PSUs have over current protection. 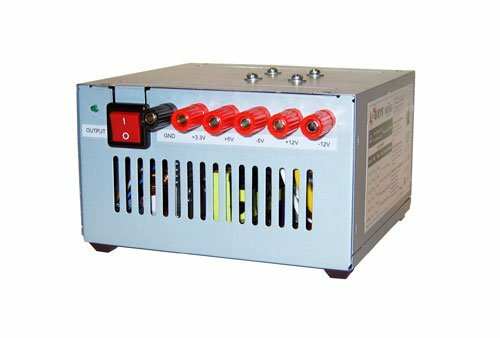 If you try to pull more current than the capacity of the rail, the PSU will cut the output until you reduce the load. I have averaged the 5 and 3.3 v combination and if I haven’t made a mistake ,I come up with 4.15V / 22.239A / for 92.29 Watts. I have also been on the RCgroup.com forum where a gentleman is using an ATX PSU for foam cutting duties with what he calls an Electronic Speed Controller or ESC of Turnigy brand of 20 or 30Amps (both available) for BRUSHED dc motor ( HobbyKing ) to vary the Dc output of ATX PSU using a servo tester/driver with an input voltage of between 3V to 12.6 V dc to operate the ESC. That 30A ESC can handle from 4.2 up to 60 Volts and a 40 Amps burst and he claims that it is operating very smoothly. Now dont think for a minute that I am getting to be a thecno that is not the case, but it does get me to think about if the 24 volts combination (the 4 pin black/yellow 12v2 ) would be something to consider for the foam cutting duty, while keeping the 12 volts for a non combined post. It is quite a bit to think about for me. I returned to the computer store where I bought my first PSU, to see what was available with more power, like 400W or more. She did show me a used 450W Acepower model: ACE450W with one 4.5″ fan on top. All +3.3V + +5V + +12V = a combined load of 430W. It seems to have more amps, just shared differently. There is a 12 V 4 pin connector but it doesn’t have the two Yellow/black striped wire as the other one, they are both yellow. That would be a straight exchange and I am more confused than inforned now regarding my foam cutting main purpose for which you suggested a 400W PSU. I do need your help to sort this out. As far as my experience goes, all the PSUs I worked with had solid yellow wires for +12v and I cut off all the connectors. It sounds like a powerful unit. You’ll have to figure out where to mount the binding posts or banana jacks instead of binding posts depending on how much room you have. I hope it all works out for you. i have question. can i use +3.3 and -12= +15.3 volt to charge 12 volt 7Amp dry led acid battery. Sorry I am not familiar with battery charging. Hello Mike, I am going to make a radio out of a car stereo, which needs a 12 volts dc, I have used a transformer, but the humming sound was too loud. I heard that PSU canalso be used to supply power to the car stereo, how do I connect the wires, and what about the rest of the wires, can I leave it as it is? You should be able to connect a 12 volt rail from the PSU to the stereo. In the PSU select the yellow wires (12v rail) for the positive connection and the black wires for the negative connection. 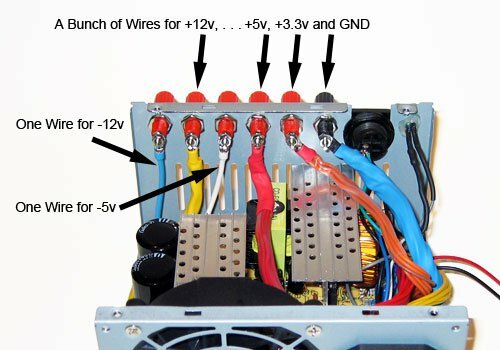 Please see this post https://pcbsmoke.wordpress.com/2012/11/21/converting-an-atx-power-supply-into-a-dc-bench-supply/ for making a 12v power supply. There is a wiring diagram plus some photos and instructions on how to tie off the unused wires. I hope this helps. is it possible to combine the minus 12 and plus 12 volts wires to get 24 volts reading on a volt/amp meter.